Back in January, when I volunteered to coordinate the Moxie Recipe Contest, I saw myself as an Elizabeth Lane-like character, holding court over a neat row of Moxie-flavored crumpets and chicken wings. I’d be a “lady writer” pounding out interesting content about cooking with Moxie. New projects always seem like movies in the beginning, full of delusions and drama. Her response was detailed and thorough. “My favorite one is the Lanvin bag because I love Lanvin but have never been able to justify the price. I bought one for myself for my 40th birthday but returned it after two days. The most practical one might be the Prada Daino. It holds a lot, has a nice shape, and is suitable for everything except cocktails and funerals. I like the Fendi pouchettes very much but the one I have I use more as a special event bag, e.g Sunday tea not daily commute. But you might get tired of orange and I would want to use an expensive bag for many years. The Fendi gives you the pop of color at a lower price. But predictable is not chic. One comment my BFF made stuck with me. “I would want to use an expensive bag for many years.” I dug around in my closet and pulled out a few of the pocketbooks I’ve been using for many years, including one of my favorite summer pocketbooks. It’s vintage and I bought it at a yard sale for 25 cents when I lived in Portland, Maine in the late 80’s. I’ve never grown tired of it, it holds the right amount of stuff, and once in a while I get a compliment or an inquiry about its provenance. It’s the little pocketbook that keeps on ticking. I’m lucky to have good friends who help me solve difficult problems, especially financial ones. As it turned out, I decided there was no orange pocketbook that would make the Moxie Recipe Contest any better than it already is; after all, I have celebrity judges, a great location, supportive sponsors, and great prizes. 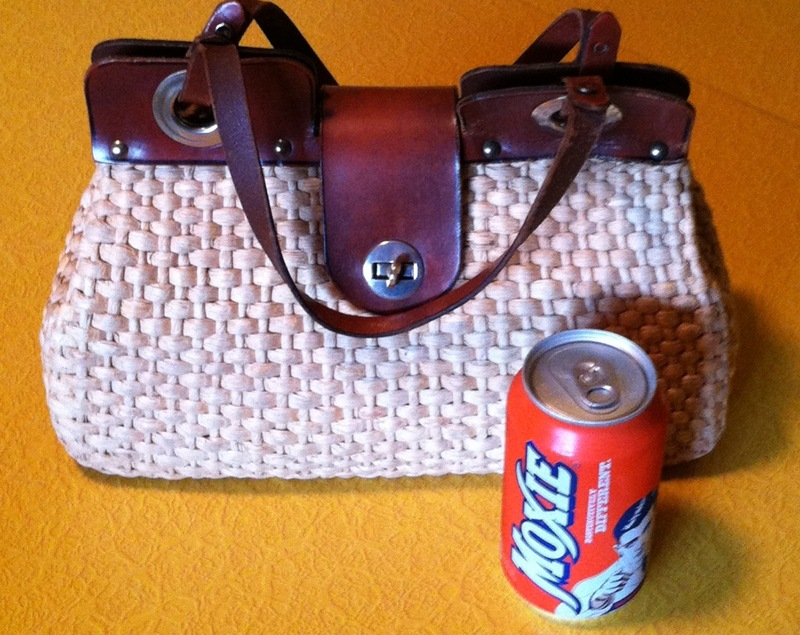 For the necessary pop of color to keep me Moxified and fashionable, I’m going to tie an empty 12 ounce Moxie can onto my summer pocketbook with a piece of orange ribbon. The Moxie Recipe Contest takes place on Friday, July 12, 2013 at Chummy’s Midtown Diner on Route 196 in Lisbon Falls. For more information about the judges, the prizes, and the rules, click here. This entry was posted in You've Got Moxie! and tagged Don't spam me Louis Vuitton, Fendi, Lanvin, Moxie Festival, Moxie Recipe Contest, Moxie Style, pocketbooks, Prada. Bookmark the permalink.